I can connect to other internet websites, but I can't connect to Online Banking. 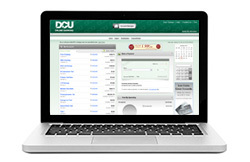 DCU's Online Banking uses a secure server with encryption to protect members' private account information. Many companies use programs called "firewalls" that prevent outside users from accessing their computers. If you are trying to access Online Banking from within a firewall, you will need to set up a security proxy. See your network administrator for proxy information and follow the instructions for your browser to set up the security proxy. We also use a temporary cookie to validate each Online Banking session. Please be sure that your system is established to accept 128-bit encryption and temporary cookies in order to access Online Banking. Are my transactions secure over the internet? Yes. Use version 8.0 or higher of Internet Explorer, Mozilla Firefox 4.0 or higher, or Safari (Mac) 6.0 or 3.0 "strong" encryption. See Security Features. Why is Online Banking slower than other websites that I visit? DCU's Online Banking uses a secure server to protect members' private account information. A secure server encrypts (encodes) the data being transmitted and received, requiring the browser on your PC to encode and decode each message before it can be understood by the host server or displayed on your screen. This process takes additional time to complete. Encryption is not used by most web sites, only on those sites that transmit and receive private information that must be protected from view. Why can't I move back and forth quickly through pages I've already viewed? Online Banking has to reload the page every time I want to go back to it. Online Banking pages are set up to prevent caching or storing the pages on your browser. This security feature prevents unauthorized users from viewing your private account information on your PC after you have completed a Online Banking session. Why do I receive blank pages when using Online Banking? Can I bookmark to Online Banking login screen? You can bookmark dcu.org and log in directly from there. Why am I receiving an error message asking me to allow the system to set a cookie. What does this mean? A temporary processing cookie is required to allow Online Banking to assign a session ID number each time you log in. This number is verified each time you send or receive information from the Online Banking host processor. The session ID number provides security for your private information by responding only to requests that contain the number. The cookie is not stored on your computer, and it is dismissed when you exit your browser, exit Online Banking, or your session times out. Without accepting this ID number, you can not log on to Online Banking. I need to update my address or phone number, where is the link? These forms are available under the My Profile section in Account Manager. What can I do with Update My Information and User Options? How can I re-order checks? You can re-order checks under Account Manager, Manage Accounts, General, then select Check Order. Can I view my statements online? Where can I find my loan interest rate? Interest rates appear on the Account Detail page. Select the account name from the My Accounts section then select See Account Details. You can also select Quick Peek for a snapshot of your loan details and recent activity. Can I make principal payments to my loans? Yes, except for Visa. Choose Pay to Principal from the drop down menu located in the Make a Transfer screen. Principal payments do not affect the due date or amount of your regular payments. Principal only payments are not allowed on Visas. Can I set up a notification? Yes, you can set up notifications for balance level or certificate maturity. Select the Notification link from the gray navigation bar to add, view, edit, or delete notifications. To understand balance bevel notices you receive, make sure you enter an email message when you set it up. Otherwise, the email will be blank. Your notification criteria will be reviewed once each day in order to send you an email if your notification is reached. Can I print out my account information? Yes. Select the Print link from the Account History page. A printer friendly version without color or graphics will be generated for you. Where is my account history? Select the account name that appears within the My Accounts widget. You'll be taken to your Account History page where you'll be to review recent history or set a custom date range. Can I export my account history to a financial or spreadsheet software? Yes. Select the Export link on the Account History page to select the history export to perform. Online Banking supports exports to Open Financial Exchange (OFX), Quicken (QFX), and Excel (CSV). Is there a way to make sure my transfer is correct before it is completed? Yes. After you initiate a transfer, you will be presented with a confirmation to view and approve the transaction. You must select the Confirm button to complete the transfer. You can also select Cancel to edit or delete the pending transfer. Where do my automatic transfers appear? Select the Transfers tab then select Scheduled Transfers to add, view, change, or delete scheduled or recurring transfers. Can I skip a scheduled transfer? Unfortunately, that service is unavailable at this time. You will have to delete the scheduled transfer and add it again later when you want to start the transactions again. All completed transfers appear in Account History. Is there an expiration date for my transfers? There is only an expiration date if you select an End Date or specify a certain number of transfers. If you select No End Date, the transfer will remain until you cancel it. If the transfer is a recurring payment to a loan, the payment will end when the loan is paid off. Can I find out if my Scheduled Transfer failed? Yes. If you have entered your email address and message on the Add or Change Scheduled Transfer page, you will receive an email notification. You can also view this on the Scheduled Transfer screen under the Last Transfer Status column. Metavante® provides Bill Payer to DCU members. DCU pays all costs to keep the service FREE for all DCU members. Will bill payments overdraw to my Primary Savings or DCU line of credit? Yes. Bill Payer transactions follow your established overdraft path. DCU will always looks to cover the transactions from you Primary Savings if there are not enough available funds in your checking. You may have chosen additional overdraft paths as well. Fees may apply. Please see DCU’s Schedule of Fees and Service Charges. How do I sign up for Bill Payer? You can sign up for Bill Payer by selecting the Bill Payer link in Online Banking, filling out the online form, verifying the information on file for your DCU account, and clicking submit. Once you are signed up, you can start using Bill Payer right away. How do I add billers? When you access the Bill Payer screen after your application has been processed, you will be able to use the Pay Someone New field to add your billers. You will input information from your current billing statement to add the new biller. Can I set up my billers to the system schedules my payments automatically? Yes. If payments to your biller are for the same amount and on the same due date, you can set the payment to go automatically. The Autopay option is located under the biller's name. How can I distinguish between two accounts for the same biller? There are a couple of ways to do this. They might either have different account numbers or you can add a nickname when you set up the biller to help distinguish it from another account with the same biller or company. Can I set up bill payments to my DCU accounts? No, do not use DCU's Bill Payer to pay your DCU loans. The Scheduled Transfers feature in Online Banking can be used to schedule your DCU loan payments transfers from your checking or savings accounts. The Account Transfer feature can also be used to make one time transfers or payments to satisfy your loan payments immediately. One of my billers moved. How can I edit the address and phone number? Click on the biller name then select View/Change Payee Details and make changes as needed. Make sure you do this well in advance of any scheduled payments. How do I add single payments? The billers you have previously set up will be listed in the Make Payments section of Bill Payer. Enter the amount next to the biller you want to pay. The dynamic calendar will show you the earliest date you can expect your payment to arrive. You can schedule your payment to arrive any time later by entering a due date up to 12 months in the future by manually typing in a date or by choosing a pay date from the calendar. Why does the system ask me for a Pay Date of my payment instead of the due date I want the payment to be withdrawn or processed? You are required to select a Pay Date for your payment. The system then automatically schedules the processing date based on the delivery time required for the biller. This functionality provides the ability to schedule payments in the future without needing to refer to a calendar to determine the withdrawal date based on the number of business days required for processing. The payment actually leaves your account on the same day the biller is scheduled to receive it. Once the scheduled payment is within the processing period, it cannot be changed or deleted. When are bill payments withdrawn from my account? On the payment date or later depending on the payment method. Can bill payments be withdrawn from my savings accounts? No. Bill Payer transactions must be withdrawn from your DCU checking account. Can I change my payment? Yes. You can change the payment amount, date, and withdrawal account of a payment as long as it is still in a pending status. The ability to change this is accessible from the Make Payments screen. Can I make international payments using Bill Payer? The Bill Payer service is for sending payments to billers located within the United States or U.S. territories with the exception of federal tax payments or court ordered payments. How do I pay a bill next day or immediately in Bill Payer? If you set up a payment today, it can take up to four business days to arrive to your biller. You can choose to set up an Expedited Payment for an additional charge of $5.00 for an electronic payment or $30.00 for a check payment. Why is there a difference between the pay date I enter and the date my payment is actually credited to my billing account by my biller? Some billers may have a posting time between receipt of payments and posting to your account. This posting time must also be considered when establishing the Pay Date in order to ensure that your biller posts your payment by the due date. Some billers require the payment coupon sent to you in your bill each month to be returned with your payment. As a bill payer service cannot send the coupon with your payment, the biller would most likely need to post your payment manually upon receipt using the information listed on the check payment. The time required to post your payment manually may delay the posting of your payment to your account. Many billers establish a separate address that can be used in order to ensure a more reasonable posting time for Bill Payments. The processing time scheduled by Bill Payer calculates the time required for your payments to be received by your biller only. Where can I see the bill payments that have already been withdrawn from my account? The View Report section displays all processed payments for the current month. From here, you can also navigate to Bill History to view additional payment history. How can I determine the status of bill payments that have already been processed? You can verify your payment status under Pending Payments located on the Make Payments screen. If you are notified by your biller that one of these payments has not been posted to your account, please contact DCU. We can determine the status of your payment and request further research on your behalf if necessary. What happens to bill payments that are not cashed by my biller? If a payment is sent to a biller and is not received within 7-10 business days, a stop payment can be placed on that check at no charge. Why can't I use a joint owner's name when paying bills? Our bill payment service uses the primary's owner's name on your DCU account on each payment. However, the account number on the electronic payment or bill payment is the one you input for that bill. If the account number is correct, the biller should properly credit the payment. When is Bill Payer available? You can schedule payments 24 hours a day, 7 days a week. Bill Payer will not schedule a pay date on a Saturday, Sunday, or a holiday. How can I check to see the status of a payment? You can view the status of payments under Pending Payments on the Make Payments screen. Does Metavante offer bill presentment? Yes. You can receive eBills from billers who participate in that service.